November 4 – Second day of challenge: have fun! I was to have a meeting with the big boss this morning, but something came up and he postponed it to tomorrow morning. After some moments of self-doubt and questioning, I went to the nearest park and watched the trees, the grass and birds. It was an inspiring moment. If I am going to convince anyone, I have first to be convinced of my ideas. And enthusiastic about them! Isn’t it great! So I am going to pump up the volume of fun! Continuing on habits, I have started the day with a little dance, -thank you Kimberly for suggesting it in your comment. It feels good! October 1rst: Make Fashion, not War! 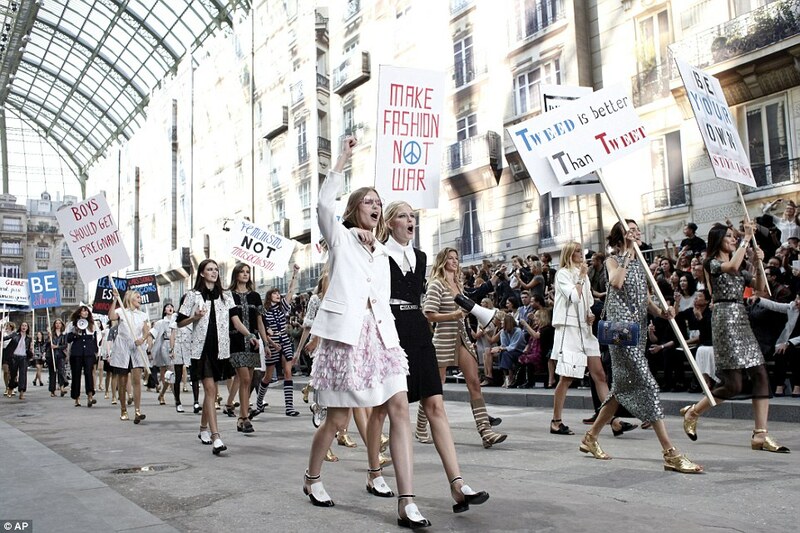 Chanel’s defilé de mode was even political: “Make fashion not war”! This is a great message, because we can interpret fashion as art and creativity, LIFE after all! This is the new season starting, let’s bring something new and creative this month!